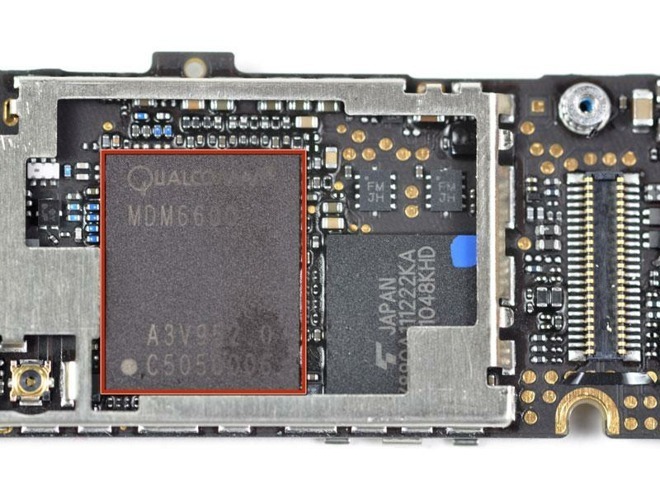 Apple's iPhone 4 for Verizon was the first to incorporate a Qualcomm baseband chip. Apple counsel Juanita Brooks continued to lob allegations of witness tampering in a filing, saying the company has reason to believe someone attempted to sway the testimony of former engineer Arjuna Siva, reports CNET. Siva, who worked on the first iPhone to integrate Qualcomm modem hardware, was slated to offer testimony on behalf of Apple in the San Diego trial. The tech giant placed Siva at the center of key claims concerning a Qualcomm patent-in-suit covering fast boot times, arguing the former engineer had co-invented the technology and should therefore be credited on the issued intellectual property. According to Brooks, Apple had worked with Siva on his testimony for month before "things changed" last week. "Apple had good reason to be concerned that steps were being taken to influence Mr. Siva's testimony," Brooks wrote in Tuesday's filing. Last week, Siva unexpectedly pulled out of a scheduled court appearance, prompting Brooks to air speculation of potential witness tampering. Following a subpoena from Apple, Siva acknowledged the basis of Qualcomm's U.S. Patent No. 8,838,949 was his idea, saying he was "surprised" and "upset" to find Qualcomm had filed for the IP. He fell short of claiming inventor status, however, a point Apple had been angling to drive home in its defense of Qualcomm's complaint. While Apple failed to provide evidence of its witness tampering claims, Brooks alluded to a possible connection to Qualcomm. As noted last week, Siva's new counsel, Matt Warren, was previously a partner at Quinn Emmanuel, the firm representing Qualcomm in San Diego. Warren, who was also subpoenaed to appear in court, claims Siva's current employer, Google, arranged for his representation. For its part, Qualcomm counsel David Nelson took umbrage at the suggestion of potential wrongdoing, saying in court last week, "I don't get angry very often. I lead this team. I consider this a personal attack." In response, presiding Judge Dana Sabraw said, "There's no indication that you or anyone at Qualcomm has anything to do with this." He added that there was no evidence to back up Apple's claims. Apple will not pursue further action in relation to its witness tampering claims, as Siva's testimony was delivered as expected, Brooks said in the filing. The San Diego case is the first action in the Qualcomm and Apple legal battle to involve a U.S. jury. Apple sparked what would become a global conflict with a lawsuit alleging monopolistic licensing practices, allegations similar to those asserted by the U.S. Federal Trade Commission in an antitrust action that wrapped up last month. Considering all the other shady stuff Qualcomm has been up to around these cases, witness tampering is not a stretch at all. As usual Florian Mueller has an excellent summary on this with information I previously didn’t know. For example, Siva already testified in the ITC case and shortly after Qualcomm dropped that patent from the case. It’s odd that Qualcomm, having been through this before, would try to go through the whole thing again in this trial. Re: Siva testifying at the ITC trial. I think that the ITC judges are, at this point, much more technically-savvy than your typical trial judge (that's not to say they are "power nerds" but still). Qualcomm likely dropped the patent because those judges were not bamboozled by geekspeak mumbo-jumbo, but in a "civilian" trial, I think they thought they could get away with it. One wonders what they said to Siva to get him to back off claims of inventorship. Must have been either a lot of money or something more sinister.